A holistic approach to body odour. We love everything about our new ACO certified organic & aluminium free WunderArms. While the product is effective and feminine and organically certified, the message that goes with our deodorant is strong and clear. Women are amazing and strong and WUNDERFUL… and we need to remind ourselves of this daily. Speak nicely to yourself. Words ARE powerful. You ARE brave. You ARE Strong. You ARE Worthy. You ARE Beautiful. Enjoy your WunderArms as a daily reminder that you are a high value woman. WunderArms is an anti-odourant not an anti-perspirant. It’s a stunning aluminium free roll on deodorant designed to neutralise the bacteria that causes body odour but it’s not designed to stop you sweating. We believe that sweating is a healthy body response and it’s super important that we don’t block the lymph glands from being able to eliminate. Why is WunderArms different from other deodorants? If you are using a chemical laden deodorant from the supermarket, chances are it contains aluminium! Aluminium near lymph glands is not okay in our book and not good for our health. This blocks the pores under your arms so you can’t release toxins. It’s time to take out the rubbish! When you stop using a chemical laden aluminium deodorant all those toxins you have been blocking will release causing some nasty body odour. We suggest you allow time to transition to an all natural chemical free deodorant! Once your body has released toxins and is used to using WunderArms – you will never look back! ACO certified organic & aluminium free! WunderArms is an anti-odourant. So it’s designed to stop you smelling bad! We suggest at least 1 week of NO deodorant while your body transitions before using your WunderArms. Drink more water! Your body is eliminating so help it by drinking more puriﬁed water. If you have body odour it’s worth looking at your diet. When your body is in balance you should not have extreme body odour. Eat plenty of seasonal, fresh fruits & vegetables (organic preferred). Less processed foods and reﬁned sugar will help recalibrate your body. Roll it on and keep it in your handbag and you are ready to face the world! You are amazing! Organic Aloe Vera (Aloe barbadensis) Juice, Organic Ethanol, Purified Water (Aqua), Rose Geranium (Pelargonium graveolens) Essential Oil, Sodium Bicarbonate, Xanthan Gum, Parfum (Vegetable based natural preservative), Organic Avocado (Persea gratissima) Oil, Organic Calendula (Calendula officinalis) Extract, Organic Chamomile (Matricaria recutita) Extract, Organic Olive Leaf (Olea europaea) Extract, Organic Lavender (Lavandula Angustifolia) Extract, Rosehip (Rosa canina) Extract, Kakadu Plum (Terminalia ferdinandiana) Extract, Organic Jojoba (Simmondsia chinensis) Oil. Aloe vera is quite an incredible medicinal plant full of benefits. Aloe Vera contains something called proteolytic enzymes which repairs dead skin cells on the scalp. It also acts as a great conditioner and leaves hair all smooth and shiny. It promotes hair growth, prevents itching on the scalp, reduces dandruff and conditions your hair – it’s super gentle for little one’s skin and also a powerful cleaner! Apart from smelling beautiful and fresh rose genenaium oil is used in our WunderArms for it’s antibacterial properties to prevent the bacteria that causes body odour. The oil strengthens the body’s defensive cells to deal with toxic challenges internally and externally. This amazing natural ingredient has detoxifying effects that help neutralise acidic or alkaline properties in the body. Because of this sodium bicarb can absorb odors to work effectively to reduce body odour. Avocado Oil is highly effective in smoothening up the skin stature thereby maintaining a silky skin tone. It is the high level of Vitamin E that prevents the skin from inflammations and itchiness thereby helping skin to maintain its health and softness. The antioxidants present in avocado oil is also found to be capable of soothing even sunburned skin. Research works have proved that avocado oil is highly effective against skin related diseases like eczema. We love it in our WunderArms to help prevent sensitivities to bicarb and for it’s smoothness on the skin. Evening Primrose Oil is extracted from the seeds of Evening Primrose flowers. The oil that is extracted is unrefined, and has high contents of essential fatty acids. Topically, it is also known for treating common skin complaints such as acne, psoriasis, eczema, rosacea and dermatitis. We love it as it’s super healing for skin and leaves hair silky and soft. We are obsessed with organic lavender essential oil. We feature it in almost all of our products because it benefits almost every body system. Lavender essential oil smells divine and is an excellent tonic for the nervous system soothing and relaxing and supporting healthy nervous tissue function. Brilliant for anxiety, migraines, headaches, depression, nervous tension and emotional stress. Lavender is one of the three essential oils which most powerfully stimulate the growth of healthy new cells – Tea Tree and Neroli are the others. Lavender has numerous active constituents but above all, it is primarily the balancing and normalising action of the oil which makes it so beneficially versatile. Olive Leaves have different antioxidants, all of which help protect the skin from environmental stressors. Olive leaf oil also has good levels of Vitamin A and E and is a beautiful and gentle emollient on the skin. Olive leaves contain several beneficial flavonoids, including quercetin, rutin, and kaempferol. We love how gentle and effective it is on keeping kids skin smooth! Calendula is a great healer! Because of calendars’ anti-inflammatory and antiseptic properties it’s great for sunburn, rashes, insect bites and other mild skin issues. Calendula can also help soothe contact dermatitis from environmental causes! Chamomile has so many powerful skin properties such as anti-inflammatory, anti fungal antiseptic and contains antioxidants. Additionally it is highly hypoallergenic and helps reduce skin irritants by neutralizing free radicals. We LOVE how it makes our magic bath wash smell! A rose hip is the fruit of a rose. Reship extract contains polyphenols and anthocyanins, which are believed to ease joint inflammation and prevent joint damage. It’s also rich in vitamin C, which has antioxidant properties. We use our jojoba oil for it’s antibacterial properties that help control bacterial growth in the hair follicle. It acts as an anti-inflammatory agent, soothing the irritated skin The Vitamins A and E in the oil also may have a role in this. This miracle of nature is from the Kimberleys in Western Australia and is a potent, natural wholefood source of Vitamin C and a beautiful emollient designed to soothe the skin. We love kakadu plum in WunderArms because not only does is help soothe the skin but we love supporting our local indiginous communities with purchasing this precious and sacred ingredient. Anytime you have water in a product you must have a preserving system. Otherwise the product grows bacteria and mould. To have a certified organic product the preserving systems we are allowed to use to pass the ACO (Australian Certified Organic) certification process is extremely limited. Without a preserving system we don’t have a product. There are only two preservatives we are allowed to use and still be ACO certified. Potassium sorbate is approved by Australian Certified Organic (ACO) for use in organic skincare products. It is mainly used as a food preservative, but it can also be used in organic skincare products. Potassium sorbate inhibits moulds, fungus and only some bacteria, so it is best to be combined with another preservative. The potassium sorbate in our products is a natural organic compound. It is mild, non-toxic and non-sensitising. I would never be okay with this preservative being in foods and it would be my preference to not use ANY preservative in this product but that would be actually really unsafe and would put kids at more risk than not inhibiting the bacteria. Confusing, isn’t it? There are times when ‘fragrance’ or ‘parfum’ on a label is OK and other times that it is not OK when it represents something synthetic and nasty! In our product ‘parfum’ is a vegetable based natural preservative and not a synthetic one. You cannot have an Australian Certified Organic Product and use synthetic ingredients. Our Magic Bathwash has passed the Australian Certified Organic Certification Process. We can’t wait to hear what you think of WunderArms! This is my first purchase of the deodorant and I am very happy with it. The smell is beautiful, no nasties and seems to be working! The only problem I have is it is quite wet – as if the roll-on ball is a little loose, if that makes sense? Could just be me as I haven’t used a roll-on for some time! Will be re-purchasing none-the-less! Smells lovely, leaves no white marks which is fab and actually works really well! May need reapplying during the day sometimes. This is the best deodorant I’ve ever used! It’s not irritating, it smells amazing without being too overpowering, and it’s small enough to pop into your handbag. I’ll never use anything else again! I love love love the 123 Nourish Me deoderant. It has a very plesant fragrance without being overpowering. It easy to use and keep me non smelly all day. I also had given to me as a gift the sleepy balm. It was very useful in helping with sleep as i was having chemo and relaxation and aleep were proving quite difficult. Thank you for your wonderful produces. Loving Wunderarms! It’s super gentle and doesn’t irritate my skin plus smells amazing and really works! This deodorant exceeded my expectations! I have tried so many natural deodorants and have always been disappointed. I LOVE this! Fantastic deodorant, definitely one of the best ones i have tried. I will be ordering more. I would love to see more scent choices though, just to individualise it a bit. Loving this product! Im feeling fresh all day long. It smells great and gives me confidence even on the really hot day! I’ve tried several natural deodorants. This one works really well in our hot and humid conditions and the fragrance is really nice. Works well for both my 40 year old armpits and my 12 year old’s! My first experience using a natural deodorant and I love it. It works well and has a beautiful subtle fragrance. Amazing! This is the best natural deodorant I have EVER used and I have tried them all. It also smells divine. Huge thumbs up from me. Just L-O-V-E this deodorant. It smells wonderful and I am on my 3rd bottle. And it really really works. Love it! It works and smells so pleasant! I am very happy with this deodorant. It is easy to apply, smells great and actually works. The very best natural deoderant I’ve tried, & there’s been a few… keep up the great work 123 love your products. I love this deodorant! I haven’t used anything but natural deodorant for a few years now but a lot of them were chalky and left marks on clothes or simply did not work. This one is amazing and does the job! Love it! Love the smell, only being wearing it for a couple of days now. I need to buy some more for my work drawer and handbag! I’ve tried a lot of natural deodorants and this one not only smells amazing, it actually works. I haven’t had any sensitivity unlike some other products on the market. I’m yet to try it out in a Queensland summer but so far I literally smell like roses! Love this product. This is my 3rd natural deodorant and will be the last brand I try I absolutely love it, it’s not hard to apply like others, feels light and refreshing and doesn’t stain your clothes! Will be buying regularly! Perfect size to pop in your handbag, nice smell and actually works. Wunderarms is a really great deodorant – I love that I can also have one handy in my bag & not worry about it melting or leaking or anything! Love that it’s natural. I feel safe giving it to my preteen to use. This smells beautiful and whilst I have not had a chance to try out in summer it seems to be working well so far. This is the best natural deodorant I have tried by far! This product is amazing!! It works!!!! It goes onto the skin to lovely, smells amazing and it works, even through sweaty gym workouts!!! And best of all, no rash like I get with other natural products!! I will be sticking with this deodorant!!! This deodorant is the bomb! No stickiness & super easy to use, unlike some of the other natural alternatives out there. I use this at night after my shower & the scent is very fresh & calming. Best natural deodorant I’ve tried by a long way! Love it! No marks on clothes, no sticky sensation, and no more sting! I want to thank you for this beautiful way to support the body’s natural process regarding underarm sweat gland function. I have autoimmune disease, have had cancer, & have bronchiectasis, which makes my body fight hard to maintain normal function & so I produce loads of toxins. As a result, my skin is super active, & sensitive to what goes on it. Not only does WunderArms work a treat as an antiodorant, it is so soothing on my skin – and beneath my skin. My lymph glands would ache and be swollen with other deodorants, however I have no more swelling and the sensitivity has gone. 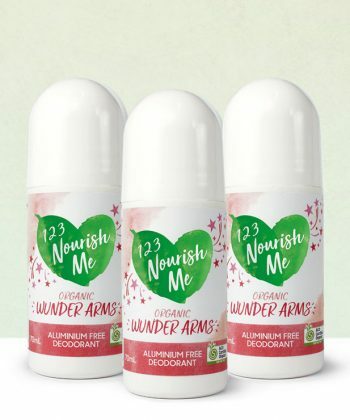 It took a good couple of weeks for the toxic smell to be released prior to using WunderArms, however now I actually feel better not having to battle chemicals – WunderArms feels like it is nourishing & supporting my body. And I love the smell, it’s a beautiful product. Thank you for making this! Absolutely love it! The scent is amazing and its great to know that I am using something that is actually healthy for me. Smells amazing and it’s the first natural deadorant that hasn’t left me with raw rashes under my arms! Smells amaaazzzzing!!! What an awesome product and I feel so much better for using it. I will never use another anti-perspirant again!! I had started using this nearly 2 years ago after hunting for a great aluminium free deodorant that provided a natural scent and prevented body odor. Well, I haven’t looked back! I’ve stopped looking, very pleased with its results. Highly recommend. This leaves a really fresh feeling under your arms when applied and no horrible stains or marks on your clothing. I have suffered with sweating through this pregnant and now at 39 weeks pregnant, I wish I had bought it sooner! Oh well at least I will be a sweet smelling Mamma! Love the smell. Very happy! I have trialled many natural aluminium free deodarants over the late few years and resigned myself to the fact that I was still going to stink quite a bit with even the best product I had found. That is until now. 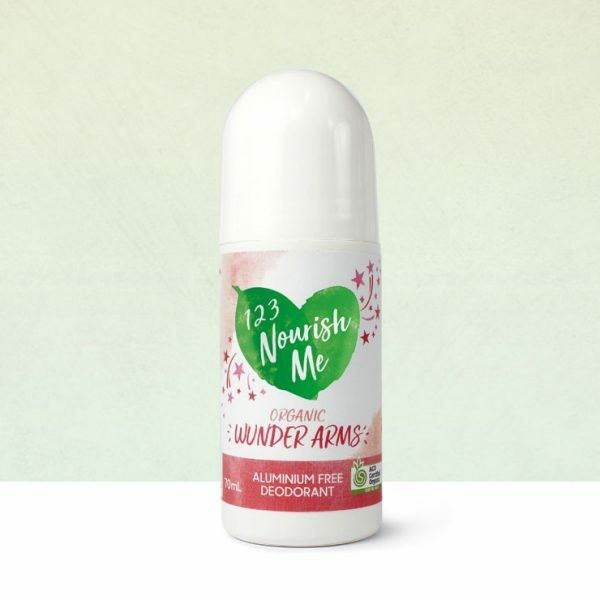 I love this deodorant, I have slent the last couple of days testing it out with sticky hot weather and even exercising… no stinky armpits, unbelievable! So glad I found this. This is so easy to use with its roller ball. Has a subtle pleasant scent. I have been using a solid deodorant bar but find it really obnoxious to apply. I look forward to continuing its use. Love this deodorant! I’ve tried heaps of “natural” deodorants and this one actually works. I have tried a few natural deodorants and I’m really liking this one. Apply a couple of times during the day as the weather heats up and I’m good to go! I have only been using WunderArms for 2 days so far, but I love the smell, and so far so good. I’m still breastfeeding my baby, which means i’m generally running fairly hot and sweaty, but I have been so reluctant to use my supermarket deo because I know it’s not good for me! I’m happy to apply WunderArms several times a day now! And I think the smell even helps put my baby to sleep!! I’m hoping maybe there will be a Husband one released soon?! Love this product – has a lovely aroma and works well all day long! This deodorant is amazing! If tried atleast 4 natural products prior & this tops them all. Thanks! Fantastic will be getting everyone who needs deodorant to use it in our house! I have used other aluminium free and they are always a disappointment, I had high hopes with this one and I was not let down!! Wunderarms was recommended to me by my boss and I am happy to say it did not disappoint! This is my first time using a natural deodorant and I am loving it. It smells so fresh and is more effective than anything I used before. Thank you! 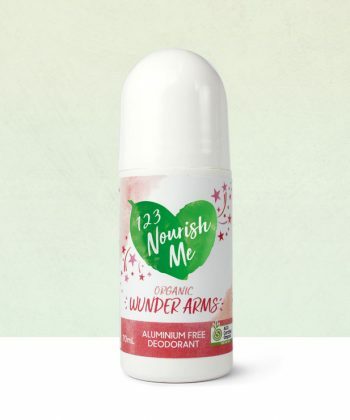 Wunder Arms is by far the best Aluminum Free Organic deodorant that I’ve used. It actually works and smells divine. It’s also such a nice way to start the day reminding myself that I am strong, brave and courageous. My son aged eight has just read my review and reminded me I’m not so brave when a cricket jumps out at me or cockroach. He is hilarious! Thanks so much for making your beautiful organic chemical free products they are amazing. This is one beautiful and super effective deodorant!! It absolutely works, and I won’t leave home without it now!! Thank you 123!! 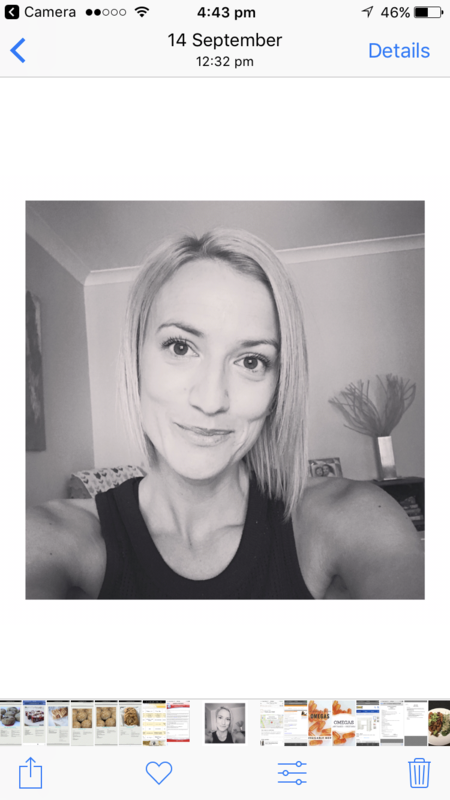 Being the mother of a toddler and working full time in an active role sweating and body odour are something I am constantly worried about. It’s really hard to find something that is good for your body, isn’t sticky and has a pleasant smell. Welcome wunderarms!! Such an amazing product. The fragrance is so refreshing, the product is easy to use, absorbs quickly and doesn’t leave any sticky residue. I will definitely continue to use this and reccomend to everyone I know. I tried this product after many other natural odorants and it’s deceivingly very effective!!. If I’m not active, it lasts all day but if I’m gyming I reapply prior. It’s easy being a roll on , and a pleasant non invasive smell to wear whenever! Love it thank you!!!! !